Read this page for recommended advice and support information for people diagnosed with depression. What can I do if I have depression? How do I support a friend or family member who has depression? There are many things you can do to help manage your depression and return to health. Being older is no barrier to getting help and getting better. For some people this list may seem overwhelming. Remember that some people use one or two individual treatments and some people use more. Your general practice team and friends and family are there to help you decide what might work best for you. See your general practice team and talk to your general practitioner or practice nurse about how you are feeling. Remember that talking about your mental health is no different than talking about a physical problem. You may need to have several appointments in case your doctor needs to rule out other conditions. In some cases, your doctor might advise referral to a specific service for older people. They may even send someone out to your home to talk with you. Read about treatments for depression. Your doctor will talk to you more about these and whether they may be right for you. It is important that you ask your doctor about interactions between your medications. 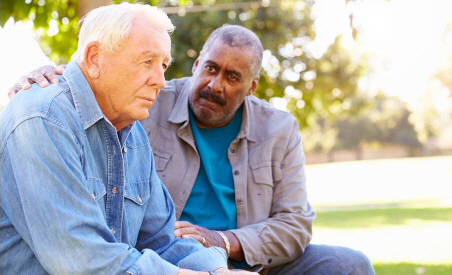 Learn about talking therapies for depression, which work by finding new ways to think about and approach events in your life. A number of these therapies have proved to be very effective at treating depression. Your general practice team or the Mental Health Resource Centre (MHERC) can help you find counsellors or psychologists in your area. My Journal at Depression.org.nz – An online self-help journal, coached by John Kirwan. Beating the Blues – Online treatment programme. To do this programme, you need to get an activation code from your general practice team. Your general practice team will monitor your progress. Back from the Bluez – An online programme of information and treatment strategies. Read about self-help techniques to improve depression. These include exercise, eating and sleeping well, staying social, joining a support group, and much more. Ask your general practice team or Age Concern for help with finding a support group, social group, or exercises group to join. Plan one fun thing every day. This Fun Activities Catalogue will give you some suggestions of activities worth considering. BluePages – Antidepressants – Information about the main types of antidepressant medications used in New Zealand. Beyondblue.org.au – Information about antidepressants. Learn more about depression by reading these resources and factsheets. If you are involved in caring for someone who has depression, you might like to join Caring for the Carers, which is a community group for family members looking after a family member with a physical or mental illness or a disability. Your support can make a big difference to someone close to you. It can be hard to know what to do or say but there are some resources to help you. It is important to look after yourself also. When someone is depressed they might find being a parent particularly challenging. The whole family could benefit by using some of the resources and contacting the support groups listed on Children of parents with a mental illness or addiction. Suggestions for helping someone who has depression. The Mental Health First Aid Guidelines contain information about how a member of the community can give initial help to someone who they think might be developing or experiencing a mental illness or a mental health crisis. These guidelines can help you to know if someone is experiencing depression, and gives advice about what you can do (downloads PDF). Information about suicide warning signs and suicide prevention. Australian factsheet about talking to people who are suicidal (downloads PDF). List of rights and laws surrounding patient rights, with emphasis on mental health. The following people and organisations may be involved in your (or a family member's or friend's) healthcare. MHERC can help you with contacting support groups in your area. You can find a counsellor, therapist or psychiatrist in the Family Services Directory. The Canterbury Mental Health Education and Resource Centre Trust (MHERC) provides information, education, and support within the Canterbury region to people with mental health and addiction issues, families and whānau, caregivers, and associates, agencies, and the community. The Older Persons Mental Health Service is based at Burwood Hospital and is part of Older Persons Health and Rehabilitation (OPH&R). It provides community, inpatient, day hospital, and outpatient services providing diagnosis, assessment, treatment and rehabilitation for people over the age of 65 years with primary psychiatric or organic disorder and any concurrent physical disorders. Your general practice team can refer you to this service. You or your doctor, community health worker, family member or a friend can refer you to the Needs Assessment Service to find out whether you need support to stay in your home and the types of support you may need. Written by HealthInfo clinical advisers. Last reviewed June 2016.